Thanks a lot Daisu, I think your explanation makes sense. This question is something to speculate about. What do you think happens to Takano in the worlds where she succeeds in killing Rika and all of Hinamizawa? Will she accomplish her goal of making Japan look at Takano Hifumi's theories in amazement oder will she be betrayed by Nomura-san who just played with her all the time? Will she even be killed for knowing too much about the political intrigues within "Tokyo"? Are there any scenarios which point out what her fate will be? There is another thing which bothers me, which might be not very easy to answer. After reading the Matsuribayashi chapter of the Sound Novel, I think the death of Rika's parents is the work of the Yamainu. 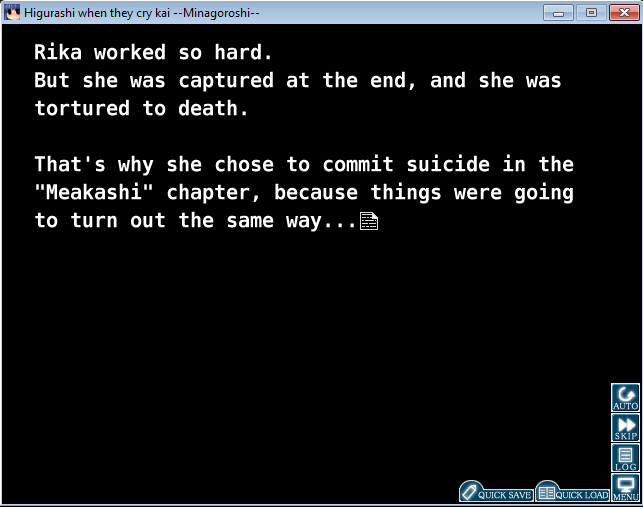 I am disappointed how rarely all the Higurashi scenarios talk about their deaths. Ooishi seems willing to investigate at first. Even if the Yamainu made the police stop investigating via their connections to the police, why is the obvious motive of the murder never mentioned or thought about by anyone later on in any scenario? Rika's mother made a lot of fuss in the clinic refusing to allow further experiments with her daughter. A few days later she disappears leaving a cliché goodbye note. At least Irie has to see clearly what must have happened to the parents, because he knows what the Yamainu can do. But somehow it seems he doesn't really care, neither does Rika, at least it is never really mentioned. By the way, has someone noticed this before? Rika always says "Mi-", Hanyu always says "Au", which makes "Meow" together. So I think it's a game between both of them. Everytime Rika says "Mi-" to someone, Hanyu adds "-Au" (which of course can't be heard by most people until Matsuribayashi). Maybe this has been known before, but I never read it anywhere so far. Last edited by Draugur; 2012-08-04 at 16:23. Its unknown what happens to Miyo after the ending of all arcs, but I personally think that Nomura got rid of her after that. And it's plain obvious that Miyo made the Yamainu kidnap Rika's mother and dad. She killed Rika's dad and dissected Rika's mother alive like she did to the manager of the dam constructing team. While that theory about Rika's "Mi" and Hanyu's "Au" is good, they've talked like this even away from the presence of each other. But we can also assume that they've done it so many times that it has become a kind of verbal tic. Sorry, maybe I didn't point out my question clearly enough. I keep asking myself why Miyo and the Yamainu got away with it so easily. It must be obvious to Irie that Miyo is behind their deaths, because he knows Rika's parents were in Miyo's way. Irie also knows that the Yamainu can do something like this and won't hesitate to do it. Oishi also doesn't seem to believe that the mother committed suicide, so why didn't he at least ask around a little? So he could have found out that they wanted to stop the experiments with Rika, and the clinic would have become very suspicious. Irie most probably knows that Miyo was the one to order the Yamainu to do it (or he might suspect that the order came from Tokyo), and if he suspects Miyo, he probably thinks she just went a little too far to prevent the stop of Rika's tests (it's not like he can tell the truth to anyone outside the clinic, Yamainu or Tokyo without endangering himself). Also, it's not like Rika's parents would tell people that their daughter was being tested frequently at a clinic. Irie or the Yamainu probably covered her visits the same way they hide the truth from Satoko: not lying about it happening, but lying about the reasons. Simple, Tokyo get away with their plan. And they use Takano as their scrape goat, so she's the one to be blamed. She probably ends up killed by Tokyo or goes to jail for their crimes. But somehow it seems he doesn't really care, neither does Rika, at least it is never really mentioned. It's stated that Rika gave up all hope on her parents surviving, so presumably in any of the worlds we're shown she just doesn't care about her parents. She just wants Satoko to survive, if she also refused the experiments they had no reason to kill her parents but it would lead to Satoko dying. Well considering how delusional Shion is at this point. I'm not surprised if she would of thought that she was Mion. 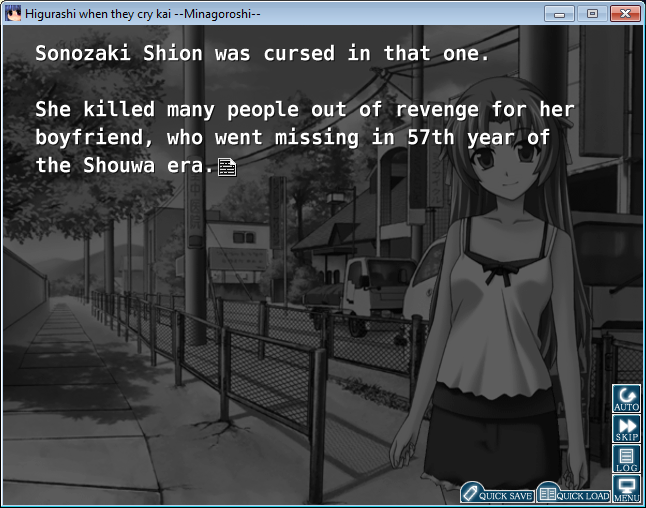 And if she did show them her back, pretty sure that would conclude she was Shion. Could be possible, instead, that Watanagashi-hen and Meakashi-hen are not the same world from multiple points of view, but just different worlds, with nearly the same plot but different villains? Namely, in Watanagashi-hen, could the guilty be really Mion, and not her sister? That scene would get a sense, with this theory, she wanted to show her back because there was really a tattoo on it. (while in Meakashi-hen there is not such a scene, as a matter of fact). After all, in one of the first episodes of Kai, they had won in the "Zombie tag" game, saying the had thought about the same strategy, due to the fact they were twins. Shion is the culprit in both Watanagashi-hen and Meakashi-hen, so they're the same story told in different points of view with minor changes. I'm pretty sure Watanagashi and Meakashi are different "worlds". The characters say different things, after all. However, all the important parts are indeed the same. You're right that they're different worlds. I was not aware of it for some time but even in the anime you see some details which are different. For example, in Watanagashi it seems Shion and Keiichi don't know Takano wants to sneak into the Saiguden until they see Takano and Tomitake are at the door trying to open it. In Meakashi, Takano tells Shion earlier that they want to sneak in. Also in Watanagashi Rika's syringe is found with her, while in Meakashi it probably went somewhere else. But in the sound novel as well as in the afterword to the Meakashi manga there's no doubt left that the killer was Shion all the time in both scenarios. You're right there. After all, I think I'm just unhappy that Rika's parents who are really strong characters in my opinion (or, at least, have a great potential which unfortunately is neglected), are treated poorly by the storyline once they're dead. There's hardly any mention of them later on. Her father is really courageous, I think, because he opposes Oryou Sonozaki and tells her to stop bullying the Houjou family. Probably he knows that he will looked down upon for showing his sense of justice. But it doesn't seem to be a big deal anyway, he just spoke his mind and has to take the consequences, that's the way the plotline deals with it. On the contrary, in Minagoroshi-hen Keiichi is praised like a messiah for helping Satoko in a similar fashion, although there is no danger for him, and convinces anyone although he doesn't even act considerately (I don't like his talk with Oryou about Satoko because there are many reasons why Oryou should forgive Satoko and help her, but Keiichi hardly comes up with these reasons but prefers threatening Oryou, saying he will smash her head etc. - sorry for getting off the topic). I also like Rika's mother very much as a character, who is passionate as a mother although we know Rika doesn't love her very much, because Rika thinks Hanyu is her real mother. Sorry, but where are these screenshots from? This isn't the Manga Gamer version, right? I certainly would remember this nice picture. In the version I got, the character design is very primitive in comparison. Last edited by Draugur; 2012-08-05 at 17:16. 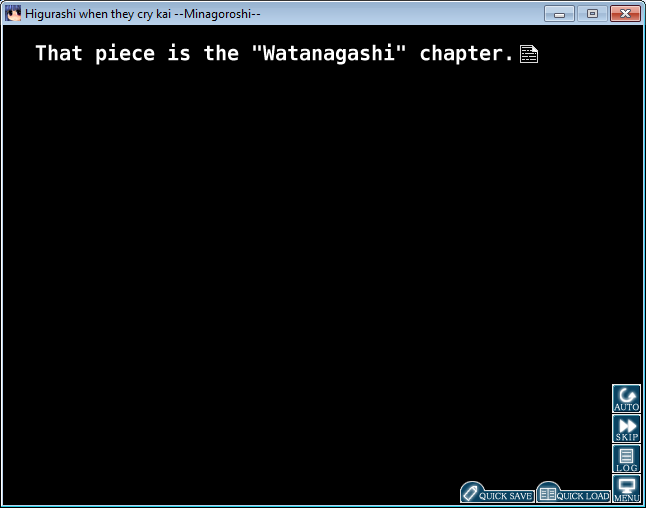 That is the MangaGamer version. However, it would appear that the game has been modified to use graphics from the PlayStation 2 version of the game, as well as a more readable typeface. The official MangaGamer releases uses artwork from the original PC version, with character sprites drawn by Ryukishi07, as well as photographic backgrounds. I actually prefer the original graphics. Oh, I see. So I've got the original version but this other version looks really good, as far as I can see from that one picture. I don't think they edited the typeface; the MangaGamer version that I used just changed font by itself for the last two arcs. That font is the one I remember from those. Bringing up Rika and Hanyuu's verbal tics for a moment. But Hanyuu's "auauau" noise always made me think of a dog/puppy, actually. While Rika's verbal tic is a cat. I usually hear "wan wan" for a Japanese dog sound, but it looks like "au au" is used in other languages too. Yep, it is used in portuguese for example. I once had a friend hear "Hauu Nano Desu" (Hanyu's image song) and he said "lol, is she a dog?". Is "nyan" (like in "nyan cat") also onomatopoetic for the noise a cat makes? "Hauu" does sound like a "howl"-ing sound a dog might make, though. Correct. It's like the equivalent of the "meow" sound we have in English. And also, "meow" isn't used in some annoying song about a poptart cat flying through space shitting out rainbows, and constantly repeating "nyan" for over 10 hours.